Some players call the game blackjack and some call it 21. No matter what you call it, learning how to play it in the casino is key to having fun and maybe on occasion beating the house. Blackjack likely originated in 18th-century France, when it was called vingt-et-un which translates to "21." But it exploded as a popular casino game after Edward O. Thorp outlined his Basic Strategy for winning in blackjack in his 1963 bestselling book, "Beat the Dealer." Which, by the way, is the ultimate objective of the game. Thanks in large part to Thorp, blackjack has become not just a means of entertainment but a way to quite possibly make a living as well. Blackjack is a deceptively simple game played with one, two, four, six, or eight decks of cards. The cards were traditionally shuffled by the dealer, but most casinos now use continuous shuffling machines. In single- and double-deck games the dealer holds the cards and deals them out. In multi-deck games, the cards are dealt out of a tray-like box that is called a shoe. Some casinos feature a shoe that shuffles as well as holds the cards. In handheld games, the cards are dealt face down and players are allowed to pick up their cards. In a shoe game, the cards are dealt face up to the players, who are not allowed to touch them. The play is the same for both handheld and facedown games. The objective is always to beat the dealer, which means getting to—or as close as possible to—a total point score of 21. If your cards total higher than the dealer's cards without going over 21, you win. If your hand goes over 21, you "bust" and lose your bet. If the dealer busts, you win. It's an interesting feature not only of blackjack but of all casino games that the house—or casino— always has the advantage. Which in the case of blackjack is 5 percent (meaning for every dollar bet, the casino keeps, on average, five cents). It's another interesting feature of blackjack that the dealer's bust potential is usually lower than the players'. Unlike in poker, the suits of the cards have no effect on the game. Only their numerical value comes into play in blackjack. Cards 2–10 are counted at face value—in other words, a two of hearts, spades, diamonds, and clubs always equals two points, and so on up the ladder to the 10. All face cards—king, queen, jack—have a value of 10. An ace can count as either one or eleven. In the play, a queen and a five would equal 15, but an ace and a five would total either 6 or 16. A hand that does not have an ace is referred to as a hard hand because it has only one value. A hand that contains an ace is referred to as a soft hand because the value can change. If you draw to a soft hand and the three cards total a number where counting an ace as 11 puts you over 21, then the hand becomes a hard hand. For example, say you are dealt an ace and a three. Your hand is either a 4 or 14. If you then draw a 10, you now have a hard 14 because if you count the ace as 11 you would have 25, which would bust you. 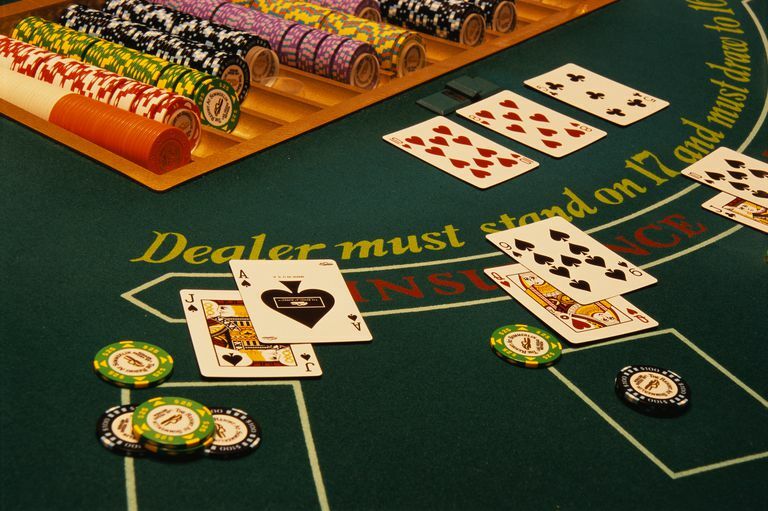 Blackjack is dealt on a special table that is semi-circular in shape. There is a separate circle or square for each player. When you sit down you must buy chips from the dealer or bring them from another table. You then put your bet in the betting circle in front of your space. Only chips put in the betting circle count as your bet. After all bets are made, the play begins. 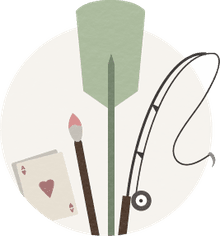 Hit — To take a hit means that you want to draw another card. To signal the dealer for a hit you tap the table in front of you or make a beckoning motion with your hand. If you wish another card after the first you motion in the same manner. Stand – Once you are satisfied with your cards, you signal the dealer that you wish to stand (not receive any additional cards). You do this by waving your hand over the top of your cards. Double Down – When you double down you are allowed to double your bet after receiving your first two cards. You then receive one card only on your hand. Most casinos will allow you to double down on any two cards (DOA). Some casinos limit your doubling to hands that total 10 or 11. DOA is a favorable rule to the player. To signal that you are doubling down you will place an additional bet next to your original bet. Most casinos will let you double down for less than your original bet, provided it meets the table minimum. This is foolish. You only double in favorable situations, and it is to your advantage to double for the maximum. Split a Pair – If you are dealt a pair (two cards of the same rank) you can split these into two separate hands. At which point you must make an additional bet equal to your starting bet. You signal the dealer that you are splitting by placing your second bet next to your first bet in the betting circle. Do not put this bet on top of the original bet. Do not separate the cards. The dealer will do this for you. Neither will you play each hand one at a time. The dealer will give you a second card to go with the first split card. You will then decide to hit or stand. After you play out this hand and stand, you will move on to the next split card and the process will be repeated. Some casinos will allow you to double down on your first two cards after splitting. You would play this as you would if you were doubling down on your first two cards. This rule is favorable to the player. If you or the dealer is dealt an ace and a 10-value card you have 21 known as a blackjack. This is a natural. If you get the blackjack you will be paid 3-to-2 for your bet, provided the dealer does not get a 21 at the same time. If you and the dealer have blackjack, that's called a push and your bet is returned to you. If only the dealer has blackjack, all players will lose. If the dealer's up card is an ace, the dealer will offer something called insurance. This is a side bet that you make by wagering half your original bet that the dealer has a 10 in the hole. If you make the bet and the dealer has the 10, you are paid 2-to-1. You would then lose your original bet, but win the insurance bet, which works out to be a push of your original bet. If you have a blackjack and the dealer has an ace, you will be asked if you would like even money for your blackjack instead of 3-to-2. If you do not take the even money, you will have a push if the dealer has a blackjack. Both the insurance and the even money bet are sucker bets. The dealers will NOT have 10 more times than they will have one. Some casinos will allow you to surrender your hand and give up half your bet on your first two cards after the dealer checks for a blackjack. This is known as late surrender. This option is not offered in all casinos, though. It is to the player's advantage when played correctly. Unfortunately, when it is offered many players surrender more hands than they should, thus giving up the advantage gained by this option. As you can see, there are many decisions that you must make when playing blackjack. If you play your hand properly you can reduce the house edge to less than 1 percent. To do this you must learn basic strategy, which is a mathematically proven method to determine when to hit and stand. If your first cards total 12–16 you have a "stiff" hand (one that can be busted with a hit). If the dealer's up card is a 2–6, it is a "stiff" hand for the dealer. If you have 17 or better it is a pat hand, and you stand. If the dealer shows a 7–ace, he or she has a pat hand. If you have a stiff hand and the dealer has a pat hand you HIT. Although this simple strategy will get you by the first several times you play the game, you really should make the effort to learn even more basic strategy. If you don’t want to memorize it you can bring a basic strategy chart to the casino with you. Most casinos allow them at the table if your use doesn't slow down the game. Blackjack can be the best game in the casino, with the lowest house edge, if you play properly. However, if you play by hunch, it will end up being nothing but a source of frustration—and disappearing funds.